One of the newest beer bars to open in Houston is the Taps House of Beer. Located on the very trendy Washington Avenue, its pretty easy to spot as the doorway is a large wooden beer cask on the front of a single store brick building. The entire bar is just one large room with outdoor patios in the front and back of the building. 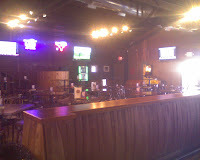 A long wooden bar runs the entire length of the right side with tables and chairs filling the rest of the space as well as a few comfortable leather recliners in the corners. Flat screen TV's ring the outside walls, making it easy to catch whatever game you're into. 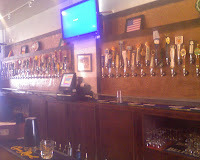 The 96 taps along the wall behind the bar does look impressive, but there wasn't anything particularly special or hard to find among them. They had the main flagship beers of the various breweries that distribute to Houston but not really any of their seasonal or speciality offerings. However, I would probably expect that to change as the fall and holiday beer seasons arrive and another round of new seasonals start arriving. While I was there, all beer was served in frozen pint glasses by default (not exactly what you're looking for in a beer bar), but you can ask for non-chilled. There isn't much for food other then some bar snacks such as hotdogs and pizza, but they were advertising a steak and baked potato special on Thursdays. I was there on a Saturday afternoon and it was pretty much empty except for the bar manager and one other customer. However, it sounded like it can get pretty busy at night which lead me to one of the major problems of the area... parking. There is none. Be very careful about where you park on the side streets and pay close attention to the no parking signs. Parking tickets and even towed vehicles are not uncommon as the area and its resident's are still getting used to its new found popularity. I'm always glad to see a new beer bar opening in Houston, particularly one that opens with that many taps. However, whether they want it to be a beer bar or just another sports bar with a lot of taps will soon show based how well they look after the beer and the lines and the effort they put into educating their staff about the beer. Its a nice change of pace from my usual haunts, but there's nothing in particular to draw me out there at the moment, but I'll certainly be keeping an eye on it. The large patio area looks like it could be nice to hang out on in during the cooler (and hopefully soon) times of the year. The Ginger Man is hosting a Sam Adams Connoisseur Tasting on Monday, Aug 31st at 7:30pm. Matt Ludlow with Sam Adams will be there and leading you through a tasting of the beers in the Sam Adams Imperial Series (Imperial Stout, Imperial White & Double Bock). Price is $11.25 per person and reservations are recommended. I tried the Imperial Stout and Imperial White earlier this year and was a little disappointed by both. However, if you're a fan of Sam Adams and those beers in particular, it would probably be a fun enough evening. I love to see stories about craft brewing in the mainstream media. CNN has an article today about the rise of beer tourism in the U.S. The number of craft breweries in the U.S. is now at a 100 year high with over 1,500, making it pretty easy to find a brewery or brewpub almost anywhere you go. And not only is there a large number of breweries, there's such a great variety in the styles of beer they produce. Most craft breweries are pretty small and their beers are often only available in the surrounding region. And in the case of brewpubs, usually only available at their location. So getting out and visiting these places is often they only way that you'll get the chance to even try their beers. We're heading to Seattle and Portland next week and I already have a list of great beer places to try and visit and beers to look for. For help with adding some beer destinations during your next vacation, check out The Beer Mapping Project website. They have free online maps with the location of breweries, brewpubs and beer stores for most major U.S. destinations. They also have a slick mobile interface to access the website from your smartphone while you're on the go. I've used their site numerous times to find a nearby beer bar when travelling. 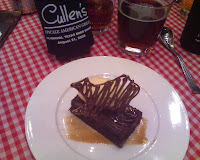 Just a reminder about the Texas Beer Dinner at Cullens Upscale American Grille tonight. The full menu for the evening is available by clicking on the image to the left. $75 per guest (+ tax and tip). Reservations are required and they do still have seating available. Also, since it's a Texas themed evening, feel free to wear jeans and cowboy boots. 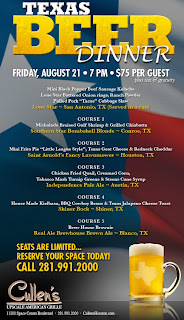 I'll be there with Amy and Rob Cartwright, founders of Independence Brewing in Austin. 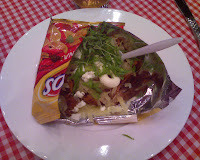 A few photos of the different courses served during the evening. The food was really good, the only issue we had was with the amount... there was just too much! With 5 courses plus appetizers, we were all pretty full after the 4th course was finished. 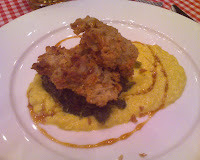 Our favourite was definitely the chicken fried quail which paired perfectly with our Pale Ale. Top left is the Mini Frito Pie followed by the Chicken Fried Quail. 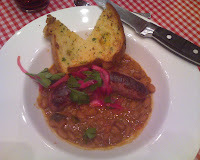 On the second line is the House Made Kielbasa followed by the dessert which was the Brew House Brownie. The full menu along with the beer pairings is available by clicking on the image above. The Bull & Bear Tavern and Eatery - 2 p.m.
McMonigel's Mucky Duck - 3:30 p.m. 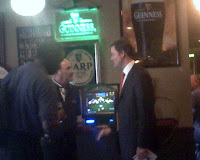 The Stags Head Pub - 4:30 p.m.
Kenneally's Irish Pub - 5:30 p.m.
Brian O'Neill's Irish Pub and Restaurant - 6:15 p.m. This will be his only U.S. book signing as his real reason for being in town is because his mother is undergoing treatment at M.D. Anderson Cancer Center. If at all possible, I'm going to try and make it to the signing at the Bull & Bear. Thanks to Beer, TX for the list of times and locations and to my wife for forwarding an email message from the Mucky Duck that announced the event. 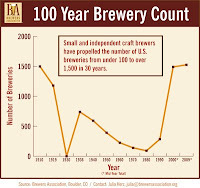 The number of breweries in this country has reached a level not seen for over 100 years. According to the latest numbers released by the Brewers Association, there is now a total of 1,525 operating breweries in the U.S. And, despite an overall global recession, the craft brewing industry grew 5% by volume and 9% by dollars during the first half of this year. That growth appears to be coming at the expense of imports and other non-craft domestics which are both down over the same period. It looks like craft beer drinkers are continuing to spend money on good beer while the macro-lager drinkers are cutting back. Or perhaps if limited on the amount of money to spend on beer, consumers are choosing quality over quantity? Whatever the case may be, the craft beer industry is continuing to enjoy solid growth year after year. All About Beer Magazine in cooperation with Beer Advocate is hosting a rare beer tasting to benefit Pints for Prostates at the Wynkoop Brewery in Denver on Friday, September 25th during the annual Great American Beer Festival. Tickets are $55 in advance ($65 at the door) and the tasting is from 1 ~ 4 pm (so it ends before the start of the evening session of the festival) and includes unlimited beer samples, hors d’oeuvres and a commemorative glass. More information and a link to purchase tickets can be found at the event website. A list of some of the rare beers being poured can be found at Rick Lyke's blog (I'm already starting to drool). If you're going to the GABF this year, you're going to need something to fill your Friday afternoon anyway and its a great opportunity to try some rare beers, meet the brewers and help out a worthy cause. I've already got my ticket and looking forward to the event. * Medal winners in last years competition. The festival map should be available later this summer. The map is particularly useful for planing out your tasting strategy. Its pretty overwhelming to walk into the convention center and see rows and rows of breweries and beers that you've never tried or even heard of. If you're attending the festival this year, I suggest reviewing the list of breweries and marking the location of the ones you really want to try on the map before the festival begins. Then prioritize the ones you really want to try and visit them first. A lot of the popular beers can often be unavailable past the first or second tasting session. The popular Saturday afternoon session is already 80% sold. All sessions have sold out for the past few years, so purchase your tickets soon if you haven't already.